The legend begins...Greece in the age of heroes. Patroclus, an awkward young prince, has been exiled to the kingdom of Phthia to be raised in the shadow of King Peleus and his golden son, Achilles. "The best of all the Greeks"-strong, beautiful, and the child of a goddess-Achilles is everything the shamed Patroclus is not. Yet despite their differences, the boys become steadfast companions. Their bond deepens as they grow into young men and become skilled in the arts of war and medicine-much to the displeasure and the fury of Achilles' mother, Thetis, a cruel sea goddess with a hatred of mortals.When word comes that Helen of Sparta has been kidnapped, the men of Greece, bound by blood and oath, must lay siege to Troy in her name. Seduced by the promise of a glorious destiny, Achilles joins their cause, and torn between love and fear for his friend, Patroclus follows. 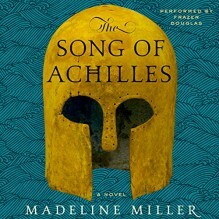 Little do they know that the Fates will test them both as never before and demand a terrible sacrifice.Built on the groundwork of the Iliad, Madeline Miller's page-turning, profoundly moving, and blisteringly paced retelling of the epic Trojan War marks the launch of a dazzling career.